Karen: There are strange rumors floating around regarding Marvel and whether they might put Fantastic Four and Ultimate Fantastic Four "on hiatus" until after Fox's Fantastic Four film comes out. Bleeding Cool initially reported that Marvel might put the titles on hold in order to not promote the film, and then published another article, reportedly showing that artists for sketch cards were told not to draw the FF or related characters. It's hard to know if any of this is true -it seems to me like it would be cutting off one's nose to spite one's face. I don't think the comics do very much to promote the films, and considering most titles sell less than 100,000 copies, it seems like Marvel would only be hurting themselves. But I'm interested to see how this might play out. It's no secret Marvel Studios (and Disney) would like to get all their characters back, and especially the FF and their related properties. The Fox films have not done very well, financially or critically. I doubt Marvel needs to 'help' Fox fail -they seem capable of doing that all on their own. "'Twas the Night Before Christmas!" Karen: Ready for the wrap-up on this little two-parter? OK, let's get to it then! Nightcrawler takes center stage as the X-Men look to assault Moses Magnum's dormant volcano base. Yup, it's right out of You Only Live Twice. Kurt bamfs inside, and thinks back about how they got there. 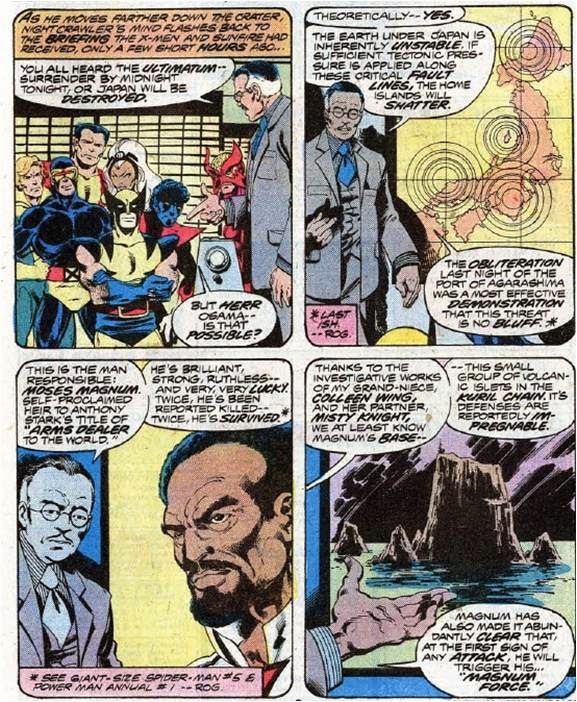 The X-Men had listened to a briefing by Mr. Osama, Colleen Wing's grand-uncle. He described to the team how Magnum had threatened to destroy Japan, and had the power to carry out that threat, by triggering earthquakes along fault lines under the islands. The government refuses to give in to his demands, so the mutants are their only hope. Nightcrawler works his way further into the base, looking for a way in for Cyclops and his team. Doug: The splash page is magnificent! 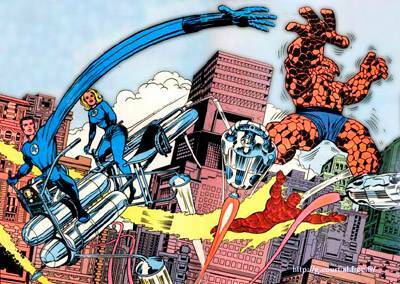 I know we gush over and over, but this era was the pinnacle of the Byrne/Austin team. Every panel could seem a masterpiece. I really like it when Nightcrawler and Colossus get major facetime in these stories. Maybe I'm just overly sullen when Wolverine's name comes up, but it's just refreshing to see that every member of the All-New team grabbed the spotlight on occasion. And speaking of the art team, all current readers should focus on that team shot in the first panel of Kurt's reflection. Scott may be drawn just a bit shy of his normal 6'3", but everyone else seems to be properly proportioned, including Wolverine! 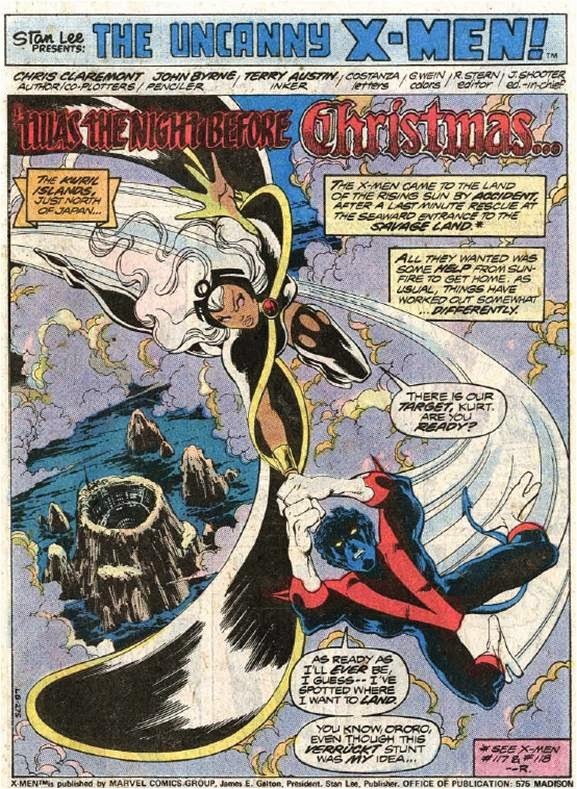 Karen: Considering Byrne wasn't that fond of Nightcrawler, we were lucky whenever he was featured! Doug: Question -- is it me, or are we working under the assumption that islands float? Because they don't. But, Mr. Osama makes the comment that "the home islands will shatter". Can something solid and anchored shatter? Would that be the appropriate term for a tree, or a mountain? Maybe I'm just missing a little geology and/or physics along the way here. Karen: Don't look at me. I studied biology! Doug: Prior to this storyline, I had not heard of Moses Magnum. That the dude had any sort of backstory at all was news to me. Karen: He definitely wasn't a major player, but like the Mandroids, Claremont seemed intent on using him. Outside the base, Storm and Banshee provide a distraction. 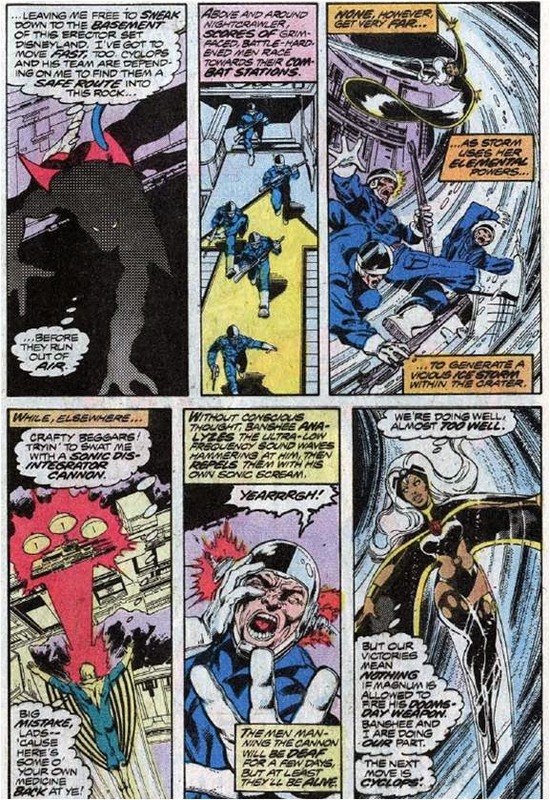 Ororo whips up an ice storm within the crater, while Banshee uses his sonic scream to put Magnum's defenses out of order. Storm wonders if things are going too smoothly -and you know she has a point! Things never seem to work out easily for this team. Far below the base, Cyclops and Sunfire have been using their powers to carve out a tunnel to sneak inside; Wolverine and Colossus round out their unit. Nightcrawler finally finds a good spot and signals them. As he does, though, he is startled by something. Cyclops' red force beam bursts through the floor of the room, and Colossus pokes his head up through the hole, relieved to be breathing fresh air again. His happiness quickly ends when he is suddenly grabbed by the neck and lifted up violently out of the hole. It's Moses Magnum! He punches Peter and sends him flying -literally. 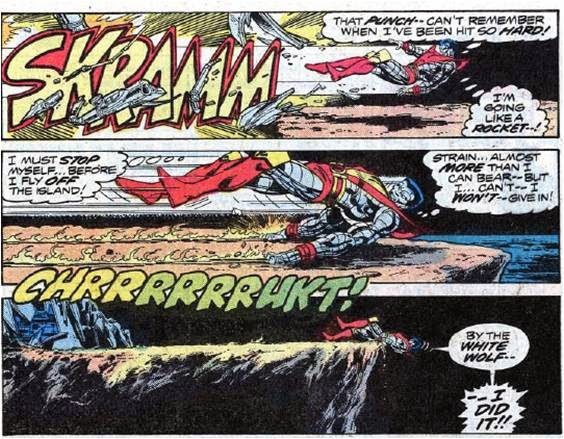 Colossus nearly shoots off the island until he manages to slow himself by dragging his fingers in the ground. After he comes to a halt, the Russian teen is disgusted with himself. He feels like he hasn't been carrying his weight lately, but vows that is about to change, and heads back into the base looking for Magnum! Doug: I know time was of the essence in this story, but it does seem odd that the Japanese government wouldn't have contacted the Fantastic Four or the Avengers. Granted, the X-Men dropped right into their laps. I suppose their association with Sunfire made them an acceptable alternative to other American heroes. Doug: I think making Nightcrawler invisible in shadows was a really cool innovation that came with development of the character over time. And as I said above, I love the fact that in this issue it seems like each individual X-Man is going to get that moment in the sun. Banshee seems really dangerous here, hmm? I wasn't buying Cyke's line about arriving undetected through their burrowing -- but, Banshee did screw up a lot of the instruments... It just seemed like part of the gear one would want to have if holed up in a volcano would be some seismographic equipment. Karen: Check again pal, Magnum says he sensed their presence -"I am Master of the Earth, armored one! No one moves through it without my being aware of them!" Doug: True. But I was thinking more along the lines of the lackeys in the fortress. Moses indeed had his ear to the ground, so to speak! Colossus was my favorite X-Man when I was a kid. Fastball special, landings out of aircraft, his devotion to his friends and teammates -- swell guy! Karen: Cyclops, Sunfire, and Wolverine are shocked by Magnum's unexpected powers -super-strength, durability, and power blasts. He's changed! Wolverine goes in to attack and gets knocked out with one punch. That's right, one punch. This was Wolverine B. G. (before godhood). Cyclops is stunned to see the feisty runt taken down so easily. 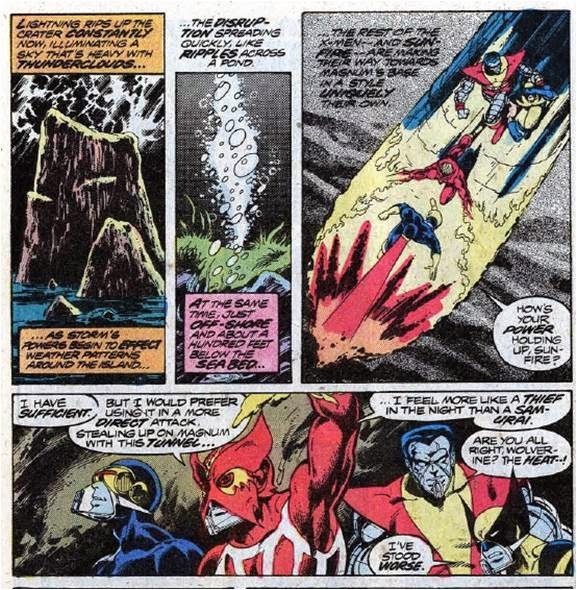 He tells Sunfire to go get Storm and Banshee -they're going to need them. However, that leaves him alone with Magnum, maybe not the best move. 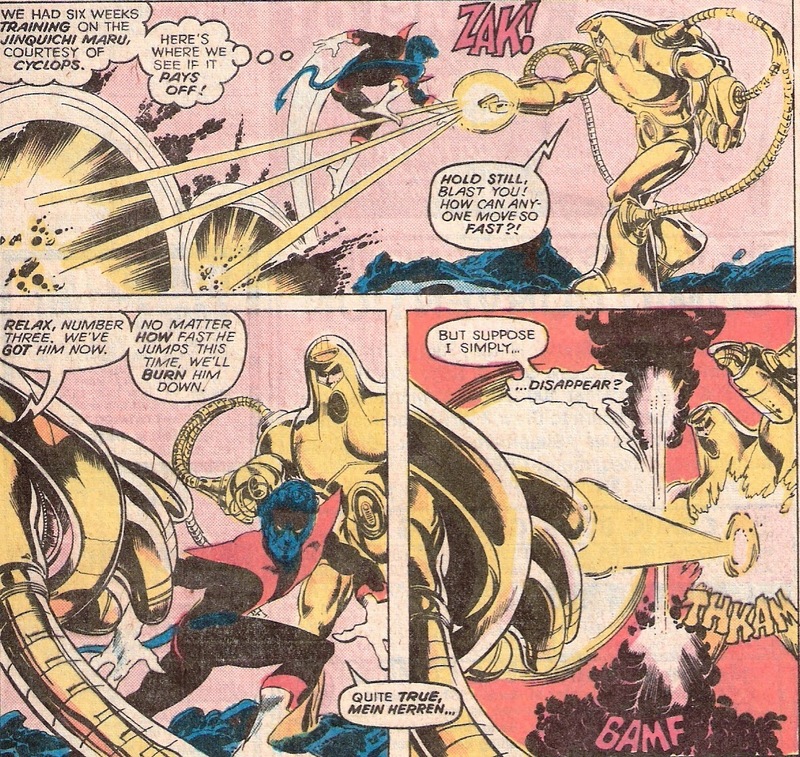 But Magnum surprisingly decides not to "waste his power" on Cyclops -instead, he calls in a couple of Mark II Mandroids to battle the X-Men's leader. Mandroids again? 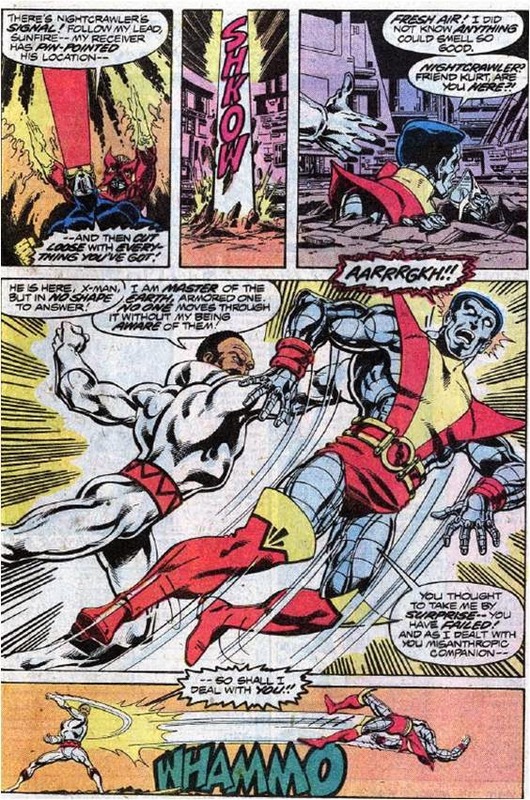 We'll never know how Cyke would have fared, because Colossus leaps into the fray, fighting almost like Wolverine -like he's gone berserk. He's taking all his frustrations out on these two! Magnum decides discretion is the better part of valor and hightails it out of there, sealing the door behind him, just as Banshee and Storm show up. Banshee has some sort of epiphany and figures out what Magnum is up to -and that he's the only one who can stop him. Uh oh -can you see the sacrifice play coming up? He tells Cyclops to get everyone out of the volcano fast and then flies outside. Doug: One of the "funner" elements of comic book storytelling is the choreography of a battle scene. Byrne and Austin get it right here, with varied camera angles, close-ups that show Magnum's furious expressions, and then John Costanza finishes each panel off with the appropriate sound effect. Really, when Colossus was trying to dig his fingers into the rock to halt his projection toward the sea, I imagined *fingers on a chalkboard* and that's basically what Costanza gave us. Nice piece of cinema overall! Karen: Wouldn't you like to see them try that in an X-Men movie? And hey, Colossus sure doesn't get much screen time in those, does he? Doug: I wasn't quite sure why Magnum suddenly decided to bolt, other than the fact that he'd lost the element of surprise. Now a known commodity, maybe he wasn't as powerful as we initially believed? Banshee complained to himself that maybe he was getting old -- I always liked that he was older than the other new X-Men and often had that "older brother" feel, maybe even like an uncle at times. Karen: I think that age differential was a problem in some ways. Having both Banshee and Cyclops together sort of undermines Cyke's authority, at least I felt that way. Not that Banshee was anything but a team player, but he could have been seen as an authority figure, given his age and experience. Magnum enters into his power chamber, deciding to make his threat good. A couple of captions explain that he didn't die in Power Man Annual #1, but was instead somehow imbued with "the power primal" - the ability to manifest an infinite amount of energy anywhere on Earth. Say what? OK, as I've said before, let's just go with it. Magnum starts to build up his energy, ready to project it out of the volcano. Banshee, flying outside, begins to project a "wall of sound" (where's Phil Spector?) around the volcano to counter Magnum's energy. Magnum, not knowing what's going on, boosts his power, and so does Banshee. Eventually, the whole island explodes. Doug: That Power Primal is some nasty stuff, hey? It would seem that Barry Allen got shortchanged when the lightning hit his chemicals and all he got was super speed... I thought the crescendo of this tale was a bit too far-fetched. In other words, my disbelief didn't quite get suspended. First off, sound dissipates in intensity, so that Banshee could be that far away from the top of the volcano and emit that sort of energy seems off -- unless he was way more powerful than we were ever led to believe. Secondly, if he could determine the "energy frequency" that Magnum was using on the inside of the volcano, well that just opens up a whole new set of uses for his power: intercepting secret codes, extraterrestrial contact, etc. So while this scene looks really cool, and there was a build up of tension within the reader, I'm not buying it all (some of it, not all of it). Awesome page, though! 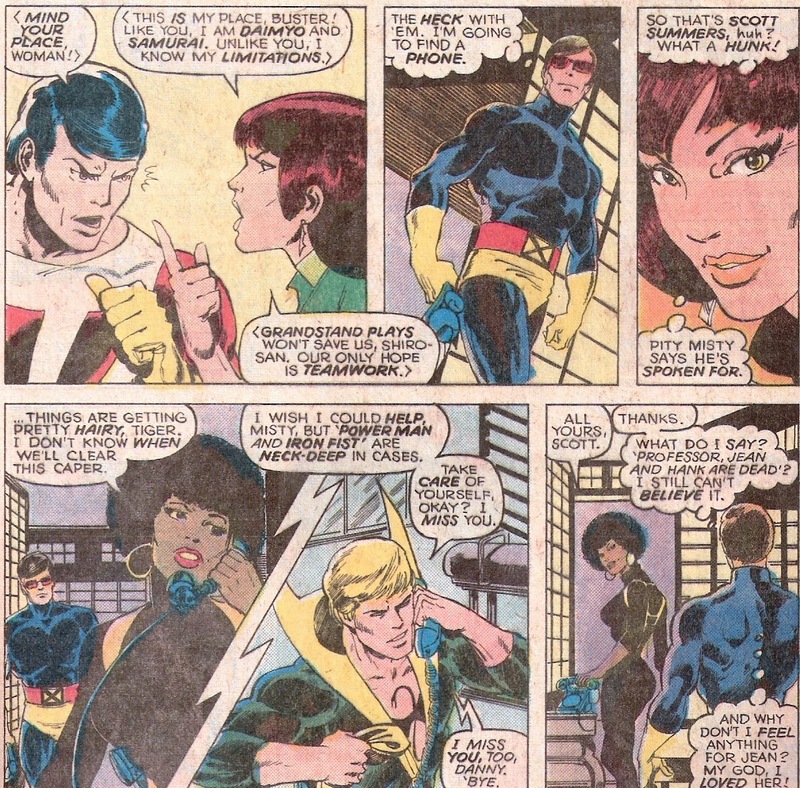 Karen: The next day, Misty Knight is out in a search plane, looking for the X-Men. Sunfire signals her and the team is rescued -but Banshee is in bad shape. Storm fears he has lost his power. We skip ahead ten days. Banshee is getting out of a car at Sunfire's palatial home. He thinks to himself that he's disappointed none of his team-mates were at the hospital when he was released -it's obvious he's hurt by their absence. But when he enters the home, the whole team is gathered under a big banner that reads, "Welcome Back Sean -Merry Christmas!" That's right, it's Christmas. The team is celebrating -although Nightcrawler and Wolverine are still in costume (I'm waiting to hear about this, Doug). Banshee can barely get out a hoarse whisper of appreciation -he really may have lost his sonic powers. 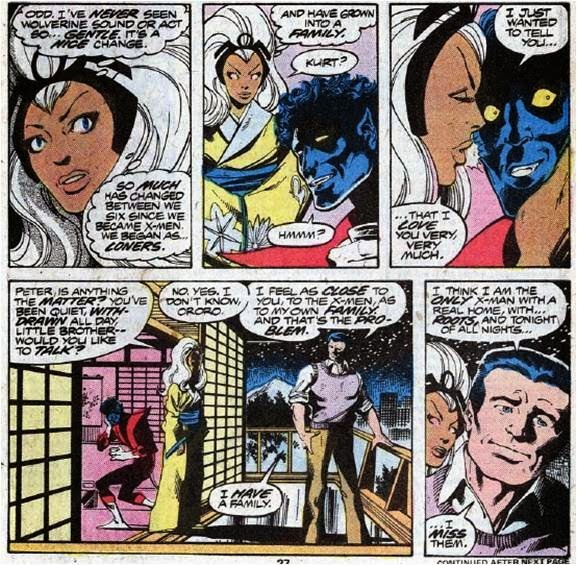 Wolverine heads off to see Mariko, and Storm thinks about how close she's become with her friends. She gives Kurt a little kiss on the cheek and he looks like he's in Heaven. Peter stands out on the balcony alone though, until Storm asks if he's OK. He's melancholy -he misses his family. Doug: This epilogue is what makes Bronze Age Marvel so great. We see the culmination (to this point) of relationships forged through accountability in battle. There is no action in the last 23 panels of the story (OK, well maybe the last two), yet I found this part of the book as gratifying a read as the "real" story. Early on I always felt that Kurt and Peter were vying for Ororo's affection; now we see how they've become their own little corner of the team, as brothers and a sister. 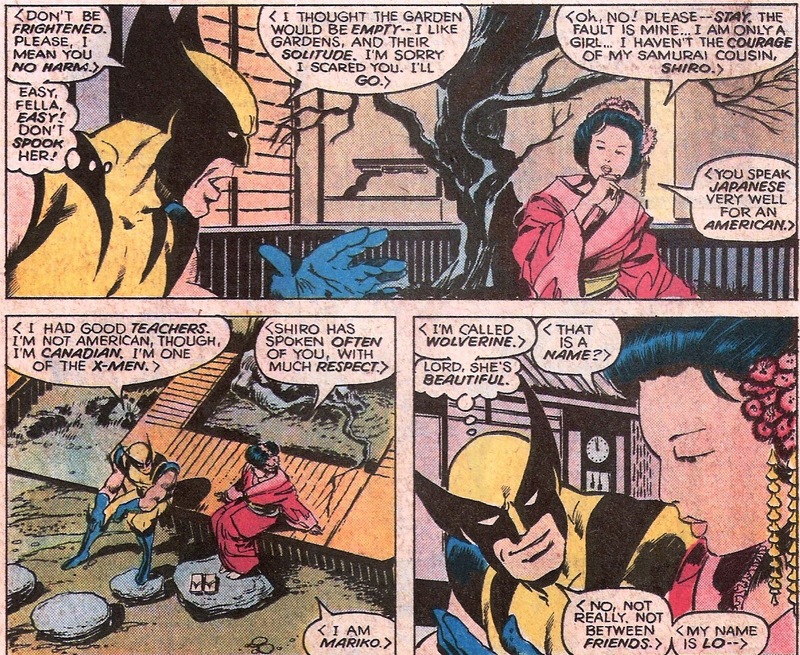 And Wolverine -- I wish this direction (with Mariko) was where they'd taken his love interests all along. I never did buy, nor care for, the subplot with Jean. It may have created some tension, but I just couldn't see it heading toward any resolution that would be satisfying (to Logan or to me!). Doug: I think some day in the future, when you and I are ready to ride off into the sunset, our last post should be a montage of our favorite panels -- a collage of heroes in civvies while doing normal things, and rubber masks! Karen: How about some Buscema blasts too? 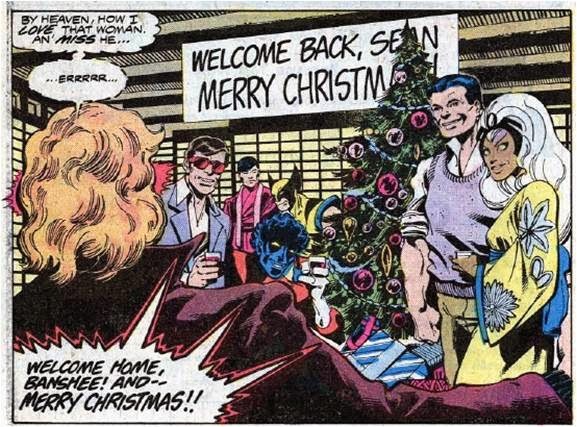 Our tale ends in Scotland, where Jean Grey, who still believes the X-Men to be dead, has come to spend the holidays with Moira McTaggert, Alex Summers, Lorna Dane, and Jaime Maddrox. As the foursome prepare to celebrate, back on Muir Island (Moira's home) Angus MacWhirter, who rented the X-Men a hover craft that promptly got blown up back in issue #104, decides to get his revenge. He plans to plant some bombs in Moira's lab -but is suddenly stopped by something - something inhuman. Doug: So I'm dense. Been a looooonnnnnggg time since I've read these X-Men stories in a run. Is Jean not the world's strongest telepath? Wasn't she stronger than Xavier when under the Phoenix Force? This whole subplot of Jean's dead/the X-Men are dead was kind of dumb to me then and now. Karen: Although this is not one of my favorite stories in the Claremont/Byrne/Austin era, it still had some nice character moments, and as always, it felt like the team was moving forward. They were really starting to feel like a team, and like friends. Each adventure seemed to bring them closer together -and pulled those of us reading these tales when they first appeared into that circle, making us feel like we knew these characters. I think that was the key to the title at this time. The reader felt a part of something. Doug: I want to say this 2-parter was like a get-me-over fastball -- don't want to walk the batter, but you also can't afford to miss with your best stuff. I agree with you -- it's pretty darn good, but not the very best. Think about it -- other than a couple of one-off misses (Warhawk? 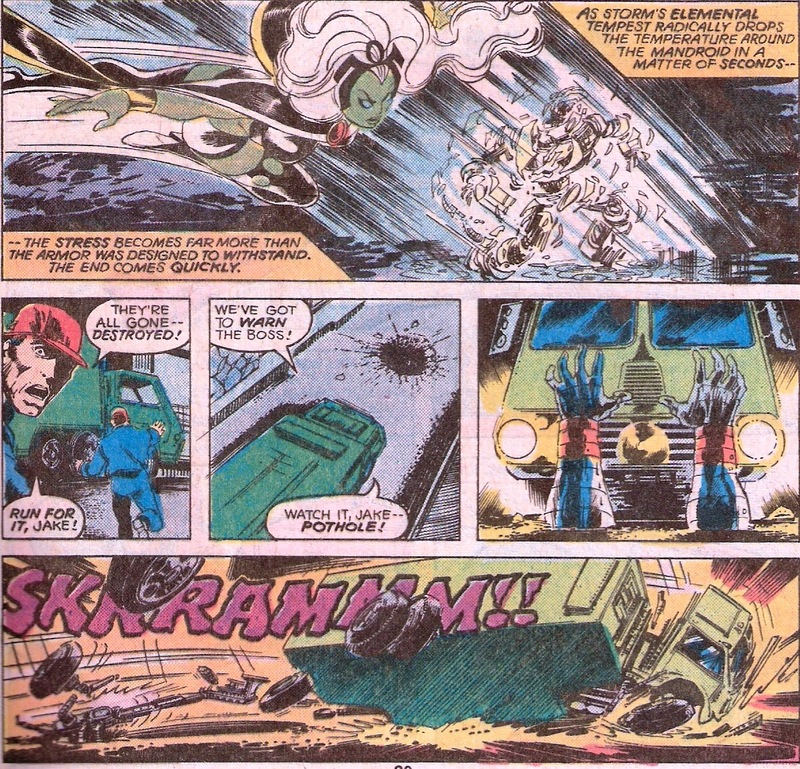 ), this train had been picking up steam since X-Men #94. No breaks. And look where it's headed! From here to the first Alpha Flight story, then to the Arcade tale (which I think I like better than do you), then Proteus, then on to the "Dark Phoenix Saga" and finishing with "Days of Future Past". Wow!! Counting Giant-Size X-Men #1 and a couple of Annuals, that's over 50 issues of generally can't-miss entertainment. I'm not sure at the height of the Lee/Kirby/Sinnott Fantastic Four they rattled off a run of 50+ like this. Close -- no argument. But this All-New, All-Different business was just solid. Doug: About a week ago our pal Osvaldo (hey, frequent his blog at The Middle Spaces) and I were having a conversation via Twitter. He made a great suggestion, so here is the fruit of that chat. 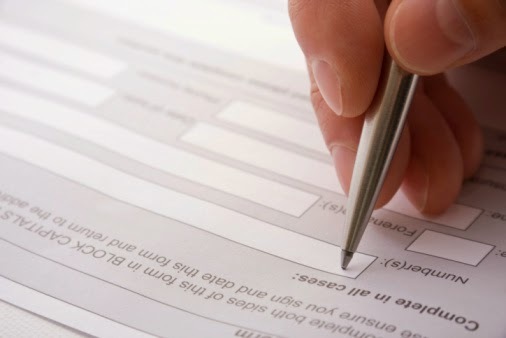 Osvaldo asked if we'd ever surveyed our readers/commenters on their age, how they came to the BAB, and various other points of information that folks like to share. I expressed that many years ago Karen and I ran polls on our sidebar in regard to some of those issues, us trying to get a finger on the pulse of our audience. Alas, we didn't save the data; of course, it would be different now anyway! Doug: Today the conversation will be all about you, then. Tell us all you'd like to tell us -- for example: how old you are, your gender (if it isn't obvious from your Blogger handle or signature line), are you married and/or with children, what line of work you're in, how you first found us and other blogs you'd recommend, what you're reading, how old you were when you started reading comics and/or when you quit, and what was your first comic you can remember? 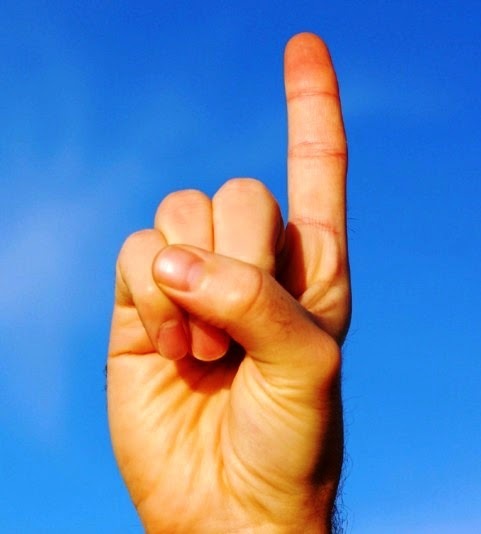 The sky's the limit -- you bring up what you want, and I'm sure the day will flow pretty organically from there. Doug: To add another fun layer, Osvaldo thought it would be cool if you left a question at the end of your tell-all comment -- such as: What is your favorite film? Your favorite superhero? Doug: Great suggestion, Osvaldo -- we hope everyone has fun with it! Karen: A pretty lame group! I saw episodes of all of these except the Fantastic Journey as a kid. But I don't have any fond memories of these shows - and I think it's obvious why, looking at these clips. But after Star Wars came out, we were flooded with science fiction programming -most of it bad! But I'd love to hear it if any of you were fans of these shows. Doug: This seemed to be a winner in its inaugural outing last week, so we'll try it again -- anomaly, or fan favorite? If you missed it, click this link to see what all the fuss was about. And if you did, here's a little cut/paste from that post -- sort of like "instructions". In this "category" we'd like your reminiscences of these books, maybe something else you recall purchasing at the same time (I've included a link to today's month/year cover dates so that you can do some research to check the accuracy of your memories), overall recollections of a particular title or creative team, and even better -- if you can recall when and where you were when you purchased a given comic. You can click on the date below to see a listing of all books published with a cover date of December '76. 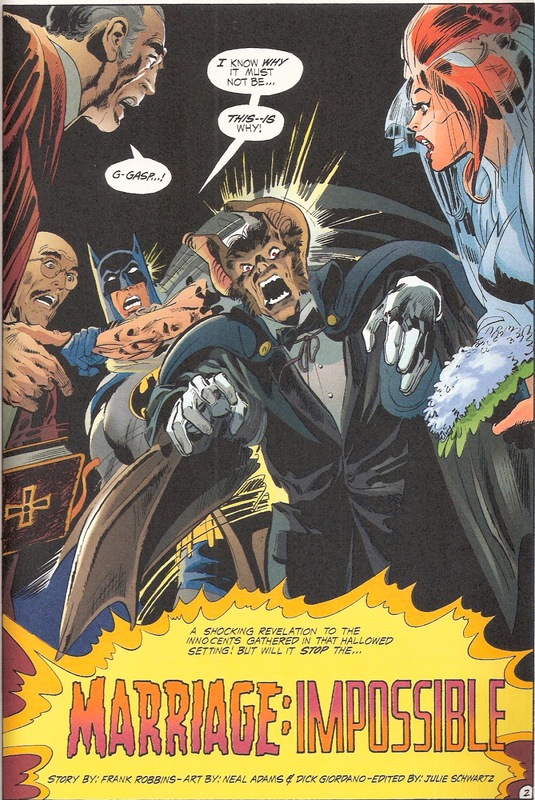 Doug: Here we are, back with another Man-Bat tilt in the pages of Detective Comics. About two weeks ago I set out to review 'tec #400 and then realized, in all my glorious senility, that I'd already reviewed it! 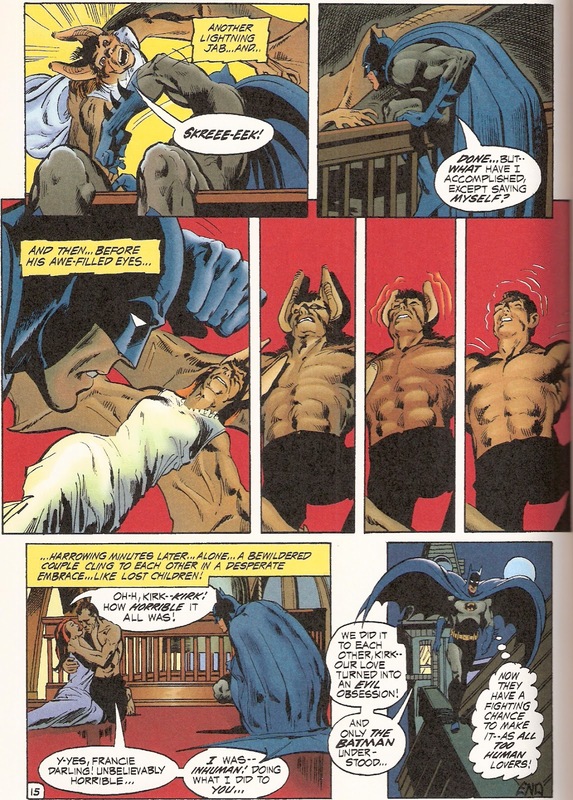 So I flipped through a few pages in my hardcover copy of Batman Illustrated by Neal Adams, volume 2, and found the next Man-Bat story -- 'tec #402. The last story was so good, and had a nice cliffhanger (Man-Bat laying unconscious on the floor of the Batcave), so I wanted to satisfy my own curiosity. And hey -- by today's title, you can see that one of true loves in the life of a BABer is coming up. The rubber mask. Doug: If you'll recall, back in Detective #400, Kirk Langstrom got himself into this mess while creating a bat exhibit for the Gotham City Museum of Natural History. On this day, as Batman peruses the newspaper he finds that Langstrom's work is finally set to be unveiled to the public. Even more attention-grabbing is the next paragraph in the story where the writer tells that Langstrom will marry his childhood sweetheart, Francine Lee. Batman's off to the church as quickly as he can go. I found it odd that on the way, Batman thought to himself that Langstrom was "the deluded genius who secretly turned himself into a Man-Bat!" OK, I suppose Langstrom did do it to himself, and I suppose it was his fantasies of being like the Batman that caused him to research the possibilities, but what struck me about this line was Batman's former sympathy and genuine concern for Langstrom in the previous installment of this story. 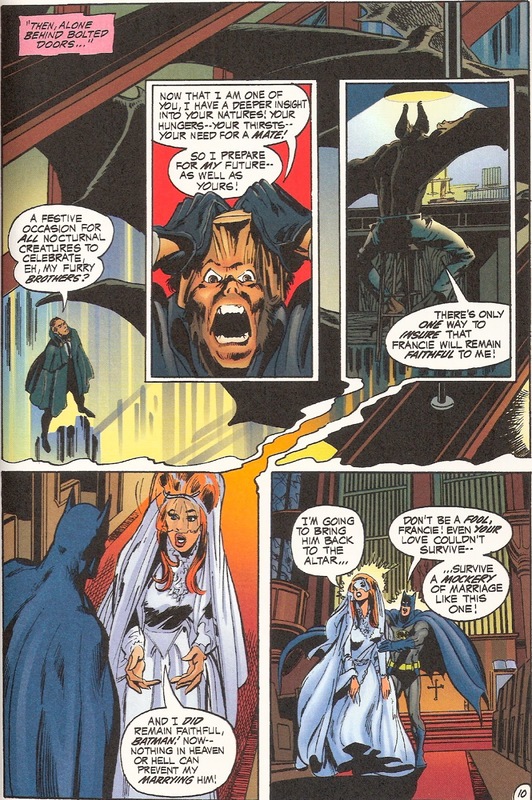 As the clergyman is about to pronounce Langstrom and Lee husband and wife, the Dark Knight swoops in and grabs... you guessed it -- a rubber mask off of Langstrom's head, exposing him as a Man-Bat! Doug: Man-Bat took off to the heights of the cathedral, while his would-be bride burst into tears. Batman asked her why she was so upset -- that surely she could not have thought of going after Langstrom in his present form. Francine told Batman that if he thought her love for Langstrom ended that night not too long ago, he was wrong. The Dark Knight then thought back to that fateful night in the Cave, when Langstrom lay prostrate on the floor, his head battered by the closing door to the Cave as he'd sought to escape. Batman, knowing Langstrom had wanted an antidote to his present condition, took it upon himself to try to duplicate the serum. But where he went wrong was in talking to himself as Langstrom came back around. 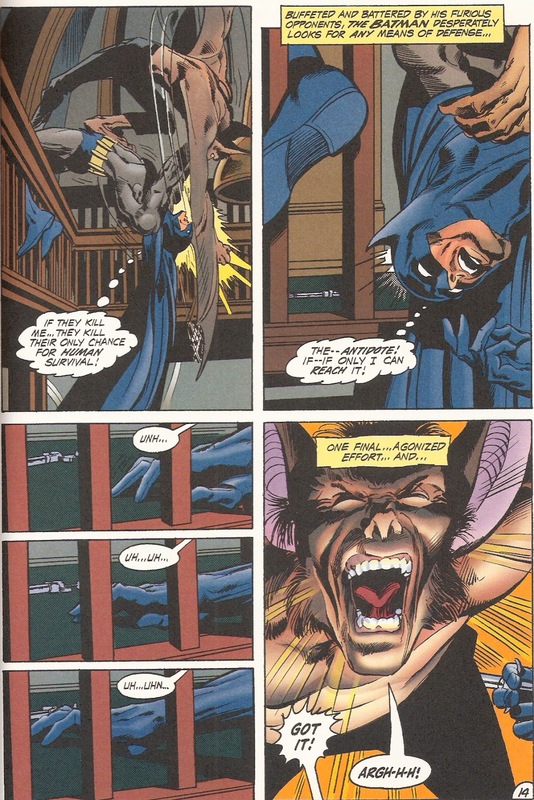 It would seem that the Man-Bat took exception to being called a "creature" -- the blow to the head had unseated Langstrom's former consciousness and left him an angry Man-Bat, now seeing things quite differently than he had only hours earlier. This Man-Bat saw Batman as inferior to him as a man, and as a bat. This Man-Bat had animosity on his mind. 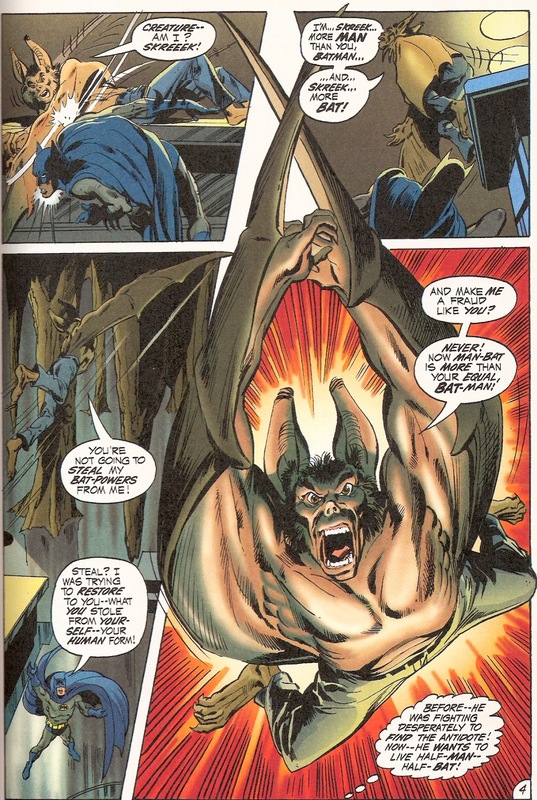 Doug: Batman's alarmed at Langstrom's last comment as he left the Cave -- that he wanted to be a Man-Bat. Knowing he could not talk Langstrom down in the current state of affairs, Batman left the Cave to get Francine. Perhaps she could coax her fiancee from the shadows. But it was no go -- Langstrom had evidently fled the Cave through the same crevice he'd used to enter. Batman dropped Francine back at her home, and left a phone number at which he could be reached in an emergency. But soon after their parting, Francine heard scratching on her window pane. It was the Man-Bat, silently asking her to let him inside. She complied, and Langstrom started right in with a challenge to her -- could she look at him without being repulsed? 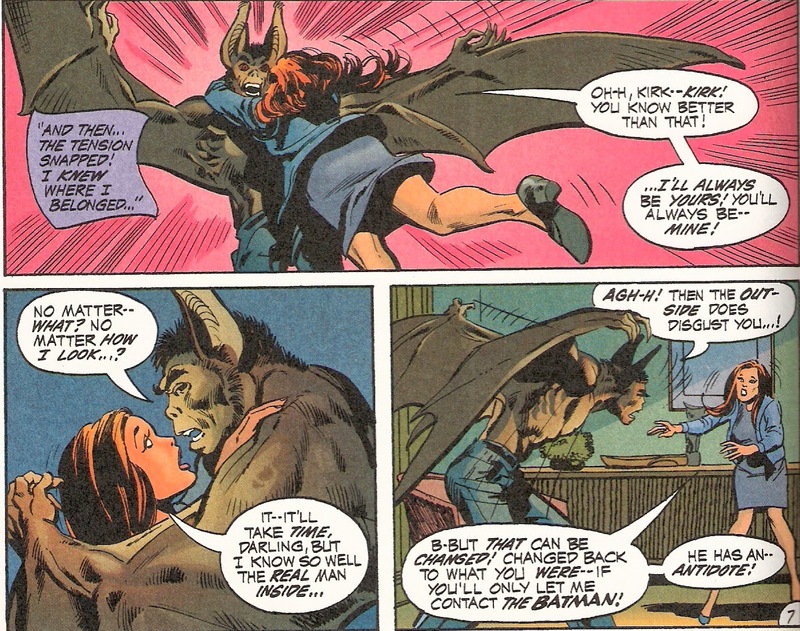 She said yes, and leaped into the arms of the Man-Bat. But she hinted that she wanted him to change back to a human form; this angered Langstrom and began to show us the deepness of his mental changes. She offered to call the Batman for the antidote, but Langstrom ripped the number from her hands and destroyed it. Not only was he volatile, but borderline hostile. He asked Francine to unequivocally prove her love for him. Doug: Back at the cathedral, Francine finishes relating this chain of events to the Batman. She says that she is going to call Langstrom back to the altar and marry him. Batman tells her that her marriage would be a mockery; and then I think Frank Robbins left the typewriter and Bob Haney sat down, because Francine suddenly removes a rubber mask to reveal that she is a She-Bat!! Holy Coyote-Ugly, Batman -- it's the NEW best rubber mask ever crafted! The Dark Knight recoils in shock, as Francine's leathery arms suddenly appear from beneath her long-sleeved wedding gown. She takes to the shadows high in the cathedral's rafters, looking for her mate. Doug: Batman barely evades a huge chandelier sent crashing his way by Langstrom, and then tries to figure out a way to get to the two bats before they fly off. Our hero truly wants to help them, but if they get out of the church, his chances are about nil. He quickly elevates to the bell tower -- the only place with open windows. 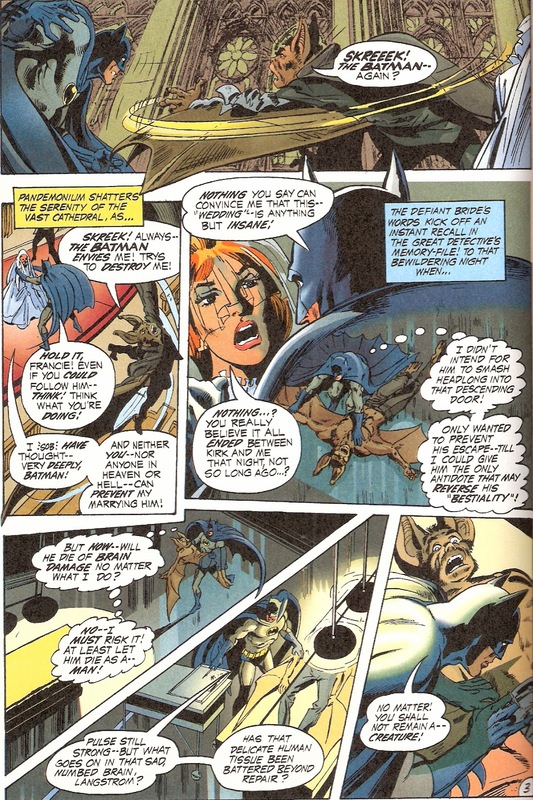 As he arrives, Francine attacks from below by ringing the bell, throwing Batman off-balance. At about the same time Langstrom attacks, making Batman drop the vial of antidote he'd carried. But in a desperate effort to reacquire it, the Caped Crusader stretched his arm as he'd never stretched before and grabbed it. Taking it strongly in his right hand, he was able to jab it into Langstom's leg. As Francine moved in for the supplemental attack, he swung the needle at her, also connecting. The two bats fell to the landing of the bell tower, and slowly began to revert to their human form. And with their change in form came a change in their psyches. They were human again, and Kirk apologized to his fiancee for what he'd put her through. The Batman had been successful in his goal to heal Dr. Kirk Langstrom. Doug: Although separated by eight issues and seven months, this 3-parter was really a lot of fun. As I remarked in my previous review, I had no prior experience with Frank Robbins' writing, but found him more than capable in handling the adventures of the Dark Knight. 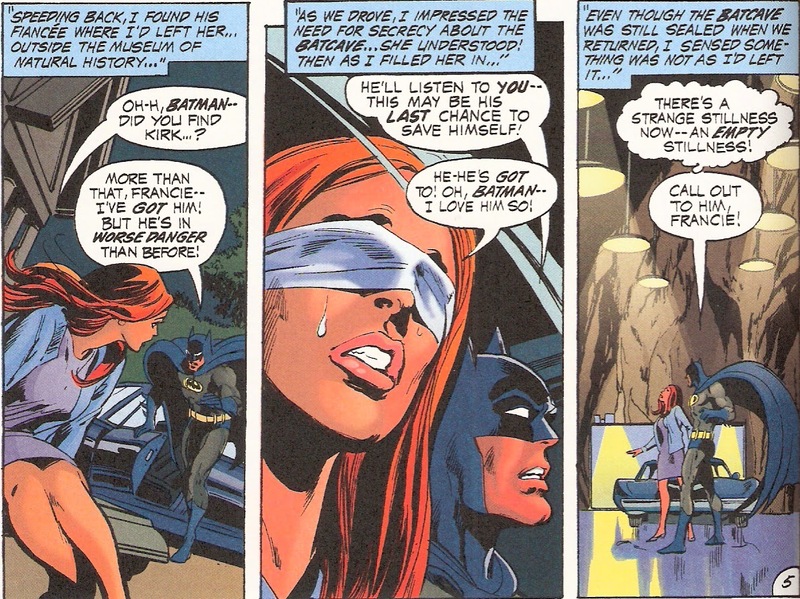 Of course I poked fun at the big reveal of Francine, but Neal Adams' rendition of that scene was just great. 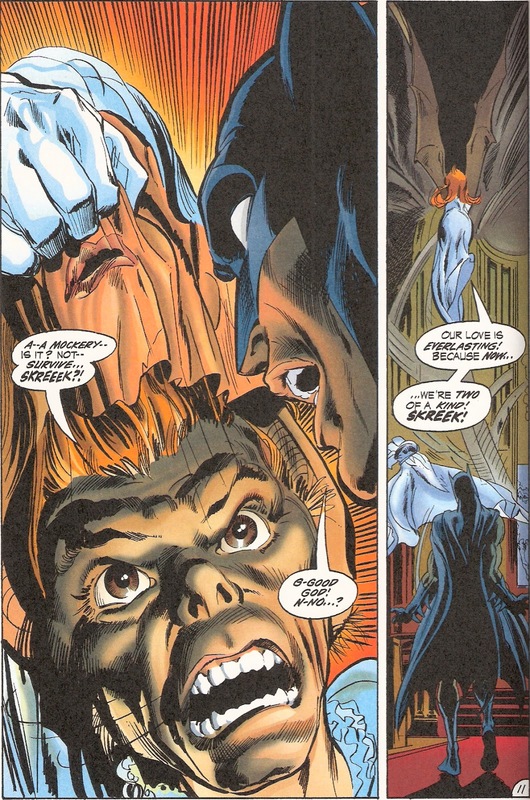 Really, we could perceive the Man-Bat character as a horror derivative, and Adams really hit a home run on that single panel. I'd recommend this "series" to anyone who digs Man-Bat; for most of us, I would guess our main exposure to the character came in the pages of The Batman Family. And oh how I wish I still had those in my collection! Karen: You know the drill -talk about the movie, but PLEASE keep it SPOILER-FREE for at least a few days! Karen: I saw it Friday night and thought it was very entertaining -maybe my favorite X-Men film -although First Class is right up there too. Quicksilver nearly stole the show! Doug: You're going to have to make a commitment today -- stand up for yourself, be firm, and all that. In yet another effort to get some pop culture conversation rolling, we're going to try something slightly new. Those who've been around for the past year or so know we occasionally toss out a query that falls under "Who's the Best...?" or "Who's the Worst...?" 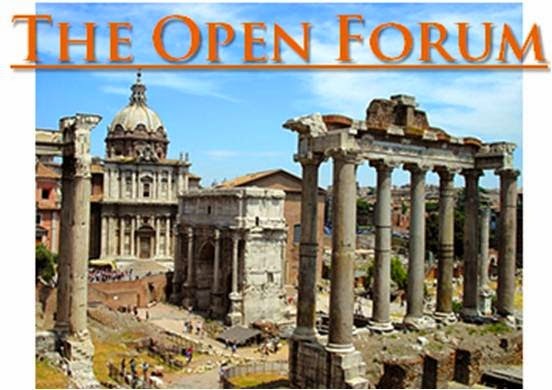 Even though the topics are narrowed down, the discussions can be somewhat broad. But today you're going to get three -- and only three -- choices and have to tell which you favor and why. No wishy/washy, kids! 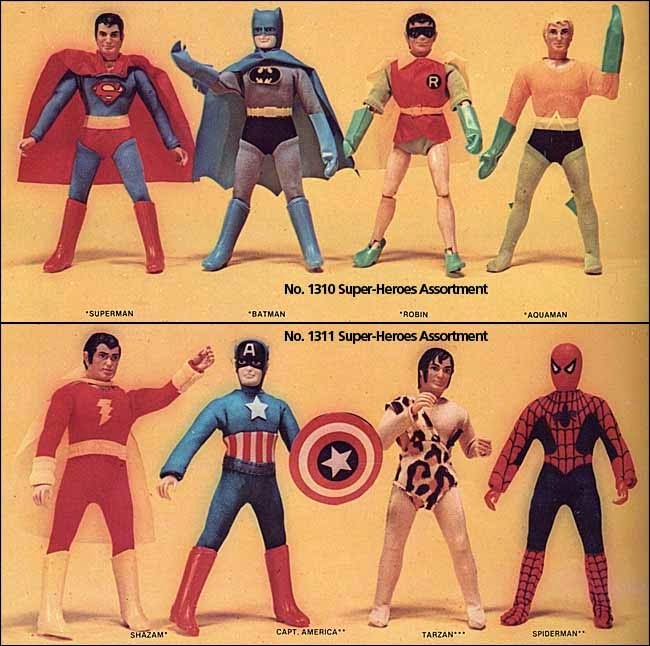 Doug: To start things off in this new category of discussion, I'm going to give you three images, each representative of some aspect of comics loving in the 1970s. You must declare which aspect resonates with you the most and then hopefully indulge us with reasons why you made your choice, and any fond or contrary opinions toward the other two choices. Ready? 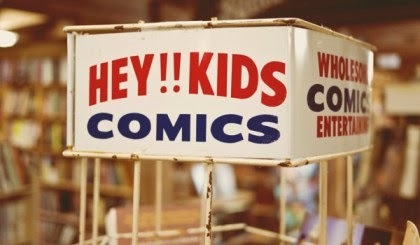 Which of the following was the coolest ancillary to comic book reading in the Bronze Age? Doug: Fancy meeting everyone here on a Friday rather than a Monday! As we'd remarked late last week, sometimes real life necessitates re-prioritizing and re-working some things, and our partner reviews for X-Men #s 118-119 falls into that category. Thanks for waiting an extra four days for this, the first of a two-part review. On Monday if you come by the BAB you'll find a follow-up to my Man-Bat story, and a week from today we'll be back here with the conclusion to our merry mutants' trip to the Land of the Rising Sun. Doug: We open on a ship about 10 kilometers from port on the island of Honshu. 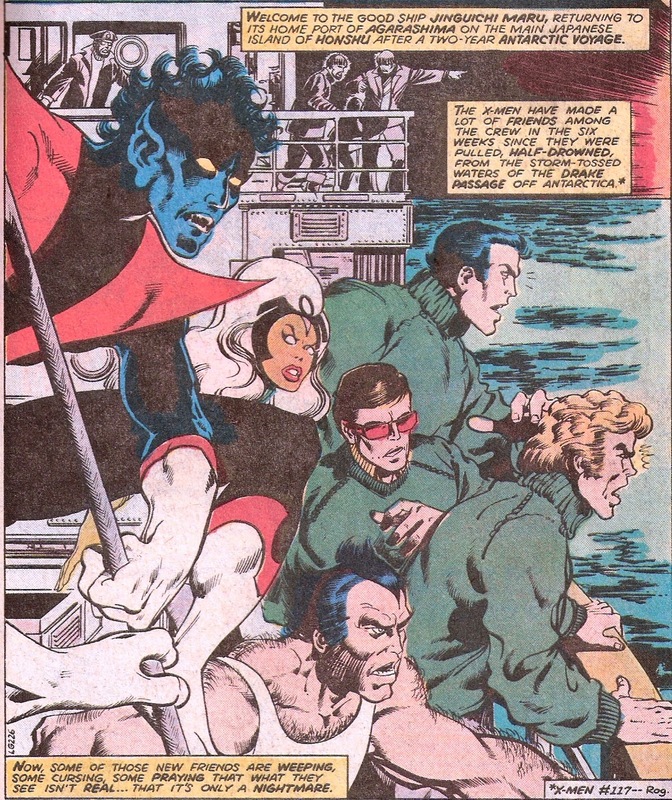 The X-Men have been aboard this craft for around six weeks, since they were rescued after their adventure in the Savage Land (which had immediately followed their second tussle with Magneto). A hot red glow is in the sky above the city of Agarashima, and the X-Men intend to investigate. 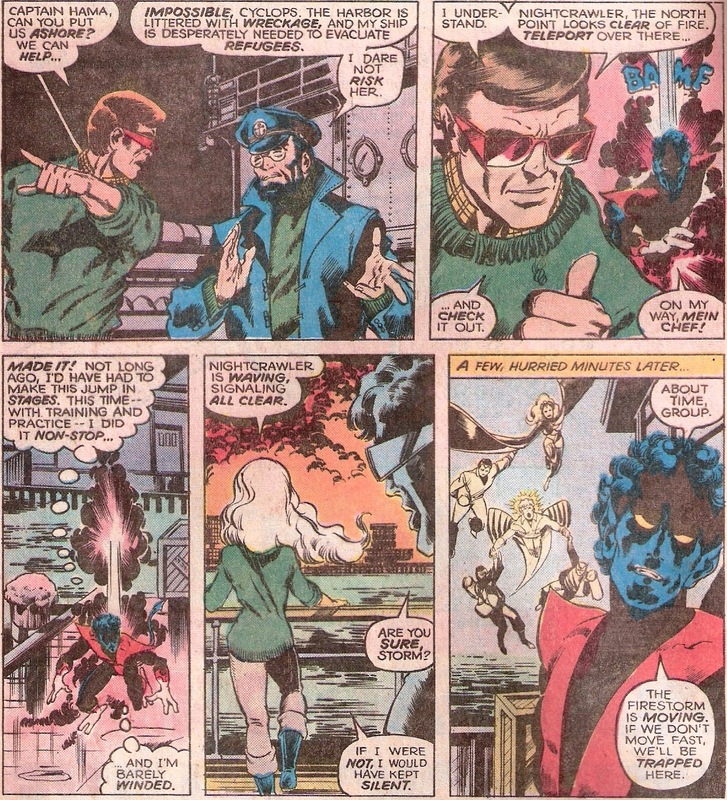 Cyclops gives Nightcrawler the order to teleport over and get a visual. Kurt does, without hesitation. Now I thought this was pretty extreme (bamf!ing over six miles?? 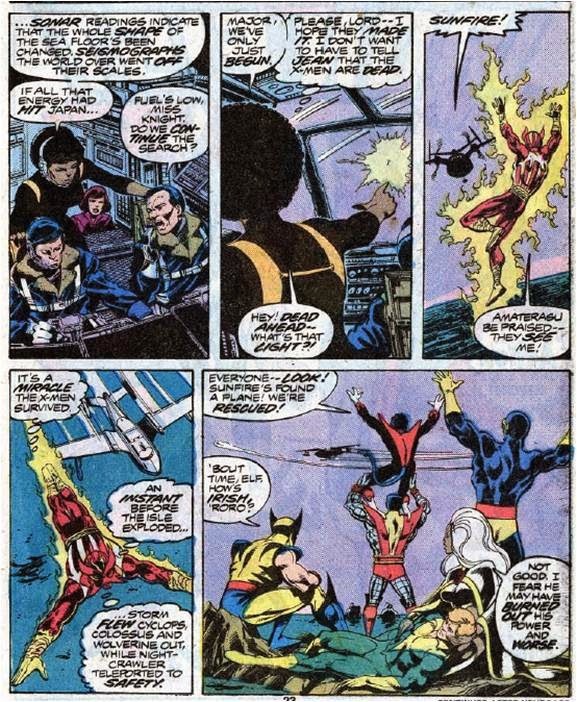 ), but even Kurt remarks to himself that without the X-Men's constant training he never could have attempted that. Shortly, the rest of the team joins him (compliments of Storm and Banshee). Cyke says that they have to locate Sunfire immediately, as they have no passports, no money, and no way of contacting Professor Xavier. So off they go, through a panicked city. But first, we get a quick little vignette as to why they cannot contact Xavier -- he is heading into deep space with his love, the Princess Lilandra. Soon, they will warp far, far away. 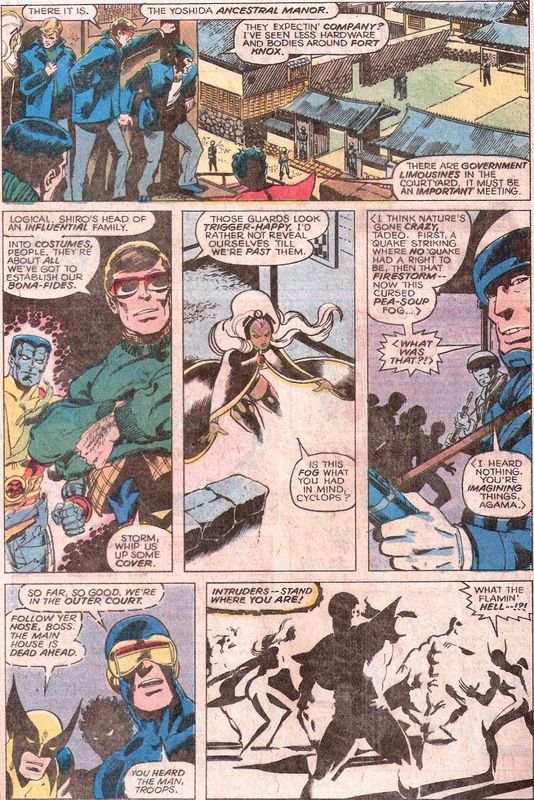 Once the X-Men are close to Shiro Yoshida's (aka Sunfire) compound the team stops to plan. Wolverine has plucked a stray newspaper and read an account of an earthquake warning. Cyclops asks him how he knows that... what, can he read Japanese? Wolverine says, yeah -- he can, and if Cyclops ever would have asked he'd have known. More layers being peeled back from Logan's background. Karen: This was back when Wolverine was still a mystery man -and still interesting. I liked the idea that he'd spent time in Japan. I didn't care much for the later stories which turned him into a samurai or ninja. My preferred version of this character has always been the savage just holding on to his humanity. Doug: Cyclops orders the team into costume, as it's their only hope of gaining a positive ID with Sunfire. The compound is heavily guarded and it appears that an important meeting is taking place within. Storm creates a dense fog to cloak the approach of she and her teammates. But they aren't very far when a blinding light splits the dense, heavy air. It is Sunfire, and he is not happy. 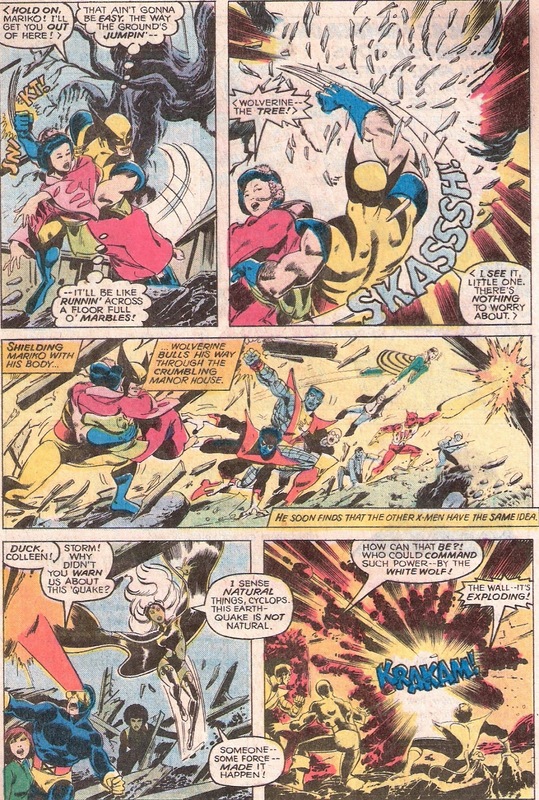 His troops encircle the X-Men, and Sunfire orders them to arrest the trespassers. And then this gets very interesting. 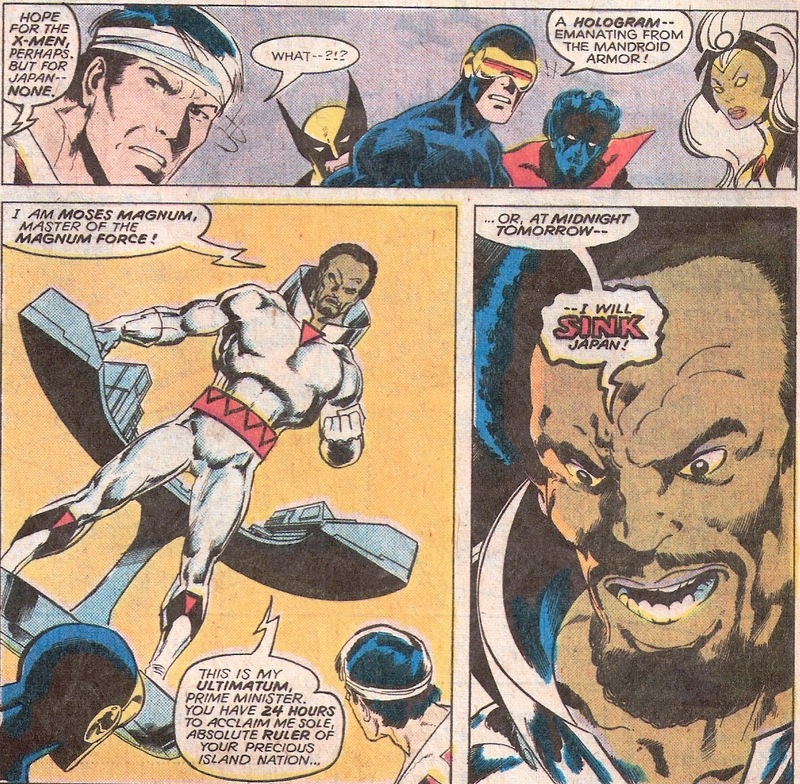 Of all people, Misty Knight emerges from the main house and overrides Sunfire's order, telling the guards to stand down. Sunfire reminds her that she is a guest in his country. She reminds him that the premier of the nation would like to meet the X-Men. Inside, Sunfire argues with his superiors that he alone can protect Japan from any further earthquakes. 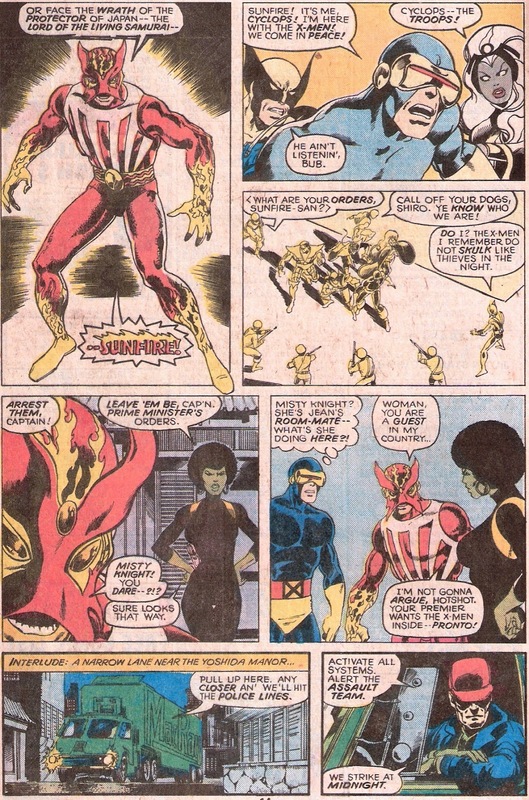 If Misty Knight is along, you know Colleen Wing isn't far behind; indeed, she's right there in the mix, telling Sunfire (in Japanese, no less) what to do. 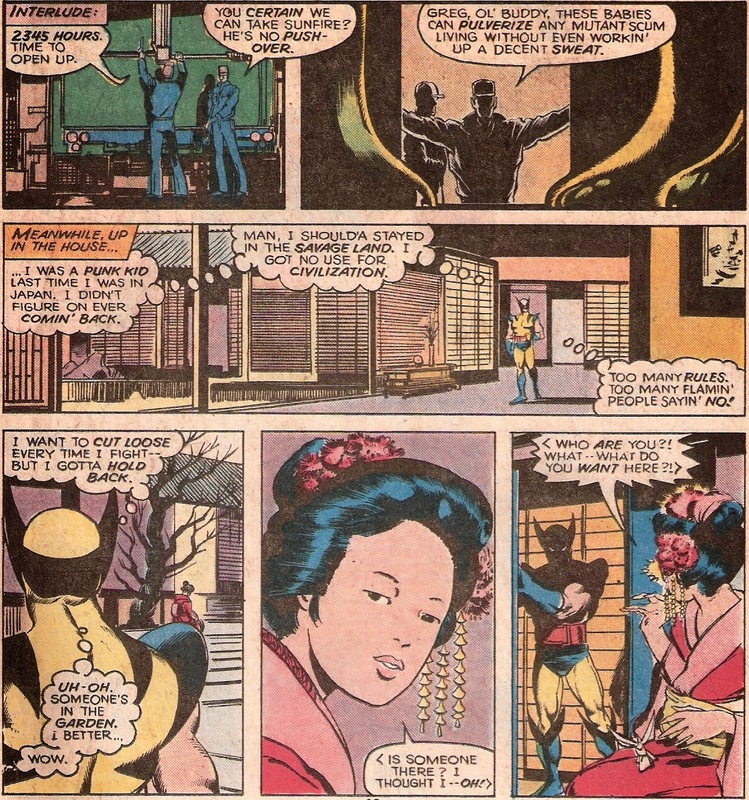 Now I don't know enough about Sunfire, and/or Iron Fist and these supporting characters, so I was surprised that Colleen was speaking fluent Japanese, was the niece of the premier, and said that she was descended from daimyo and samurai, like Sunfire. It all seemed a bit much to me. And then when Colleen took a shine to Cyclops, even though she knew he was "spoken for", I found that to be some clumsy foreshadowing. I did think it intriguing, though, that Cyke again remarked that Jean's "death" left him unfeeling and he was disturbed by his lack of emotion about it. Karen: Scott's lack of emotion over Jean's death was always disturbing -a self-defense mechanism perhaps? It certainly bothered Storm -she seemed quite curt in her responses to him in this issue. Of course, she'd blown up at him (uncharacteristically) back in the Savage Land when the subject of Jean's death came up. Doug: We cut to a second two-panel interlude. In the first, a truck driver had remarked to his partner that whatever dirty deed they were planning was going to go down at precisely midnight. In the second of these quick shots, the same guy assures his co-driver that with what they're packing they won't have to worry about Sunfire or any other mutants for that matter. And we see in the shadows of the semi the legs of Mandroids. Cut back to Shiro's compound where Wolverine is strolling around the grounds until he feels at home (coo coo cachoo -- you know what I'm saying!). He exits to a garden, where he startles a young maiden. She is frightened, but he calms her in perfect Japanese. He says he is one of the X-Men, and that he knows Sunfire. She is Sunfire's cousin, named Mariko, and remarks that Wolverine has wonderful Japanese, for an American. He tells that he is actually Canadian, and had wonderful teachers. She asks why his name is Wolverine, and he begins to say that his name is really Logan, when he is cut off by an earthquake. Was this indeed the first time Wolverine's real name was revealed? Well, OK -- almost revealed? Karen: I think one of the leprechauns in issue #103 was the first to call him "Logan" -actually, I think it was "Mr. Logan" -but this might have been the first time that he himself started to say his own name. 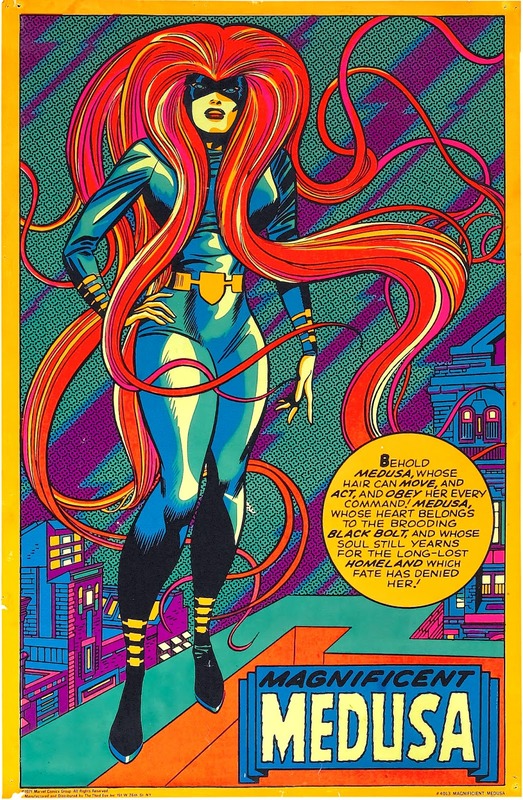 I found it interesting both then and now that Byrne elected to draw Mariko in a very stylized way -not your typical female face as found in comics, but a very deliberately Asian look. Now if one overlooks the fact that she's dressed like someone out of Shogun, it's kind of a bold move. Doug: Wolverine snatches Mariko from harm's way as a tree begins to fall. He uses his adamantium skeleton's strength to protect her as he races to the clear, away from the crumbling mansion. He soon reunites with his team, who has spirited the government emissaries from harm. Cyke regales Storm, asking why she didn't give a warning about the quake. She says that she only senses natural disasters, and what just happened was not natural! Another attack comes, this one a large blast. And then a trio of Mandroids enters the grounds and says that they are there for the government -- their boss would like an audience. 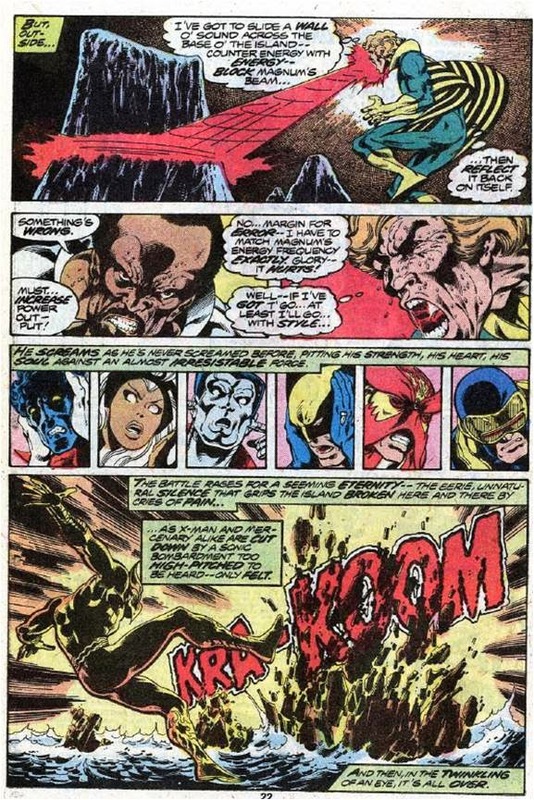 Sunfire steps forward as their protector and is dropped in his tracks by a ray blast and the term "mutie". 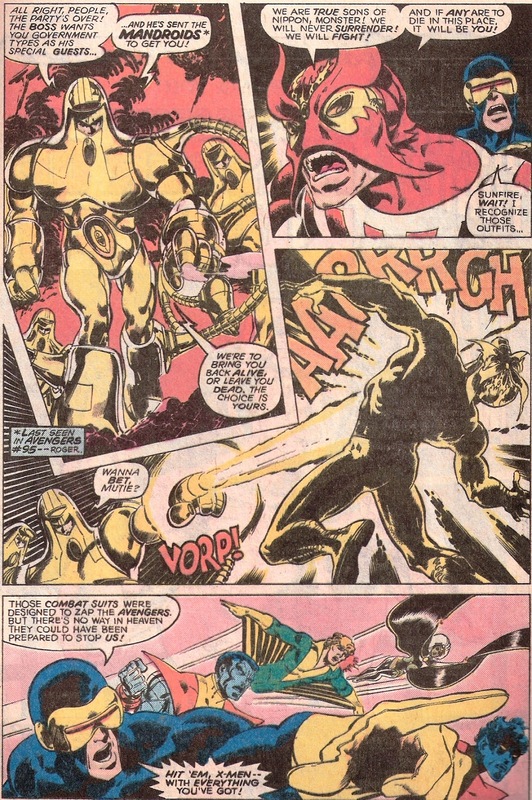 Cyke tells his team that he recognizes the armor as Mandroid technology that was designed to take out the Avengers. And then he makes a statement dripping with bravado -- "... but there's no way in heaven they could have been prepared to stop us! Hit 'em, X-Men -- with everything you've got!" Yep -- game on, as they say. Doug: You know, maybe Cyclops was right. 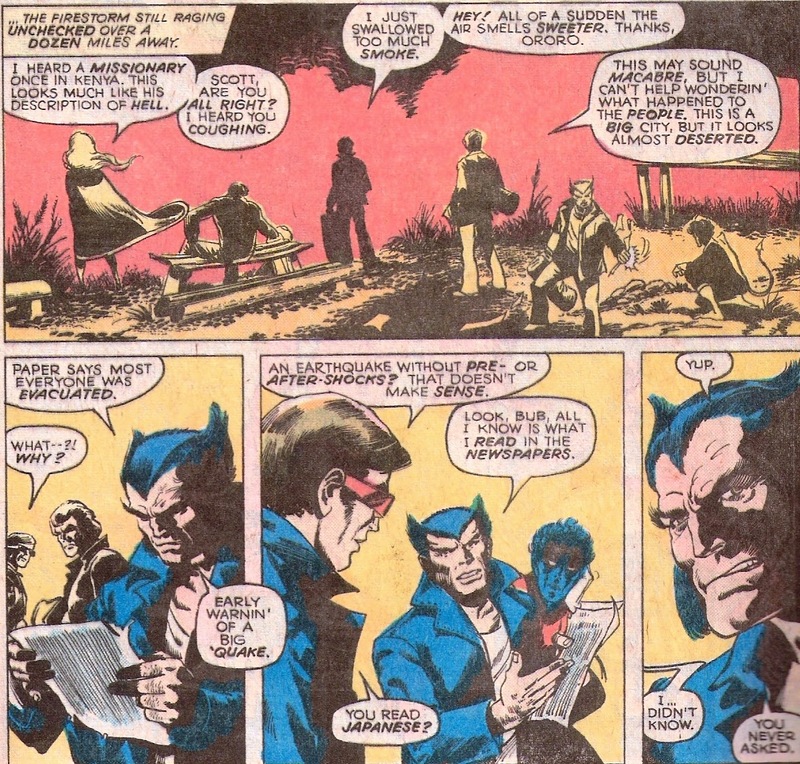 Nightcrawler is the first to engage, and his combination of speed, agility, and teleportation neutralizes "Number 3". Colossus is next up, but he gets sent for a ride by a reverse-polarity magnet, leaving Wolverine to carve up that Mandroid. Lastly, Cyke and Banshee work their magic on the third guy, literally rattling his armor off his body. But Number 3 was only staggered, not dropped, and now he takes a bead on Sunfire. Mariko attempts to shield her cousin, but is ordered to run. Sunfire launches a blast of solar energy that heats the Mandroid armor to critical levels. But the suit's "pilot" just laughs, saying he's absorbing the energy. But as he glows, Storm arrives with an onslaught of freezing rain; the stress of going from too hot to too cold wrecks the suit of armor. We cut to the streets outside the compound as they semi drivers are putting this debacle in their rear-view mirror. As they speed along, they attempt to avoid a pothole. Too late, boys -- that was no pothole. It was Colossus's landing spot. Suddenly his organic steel arms reach up through the hole and destroy the semi-truck. The next time we see Peter he's strolling back onto the mansion grounds with a driver under each arm. Doug: As the team licks their minor wounds and feels great about their easy victory, a hologram suddenly appears from one of the Mandroid suits. A man in a white suit with a Lex Luthor collar addresses the prime minister of Japan and tells him that he has an ultimatum: within 24 hours, the man must be proclaimed sole ruler of the island nation of Japan. The man's name? Moses Magnum. And if he doesn't get his way, he will sink Japan. Pure and simple. Karen: "Master of the Magnum Force" -sorry, but I can help but see Dirty Harry in my head when I read that. Doug: I liked this story -- it was suspenseful and was a nice way to get back into regular continuity after the Professor X one-off that was in issue #117. It's funny now, after all of the wranglings with Wolverine's origin, to see these early attempts at expanding on his backstory. When you think of it now, the character was only around 4 1/2 years old when this issue was on the newsstand. Makes me want a time machine to visit simpler times! And what's everyone's opinion on the art? 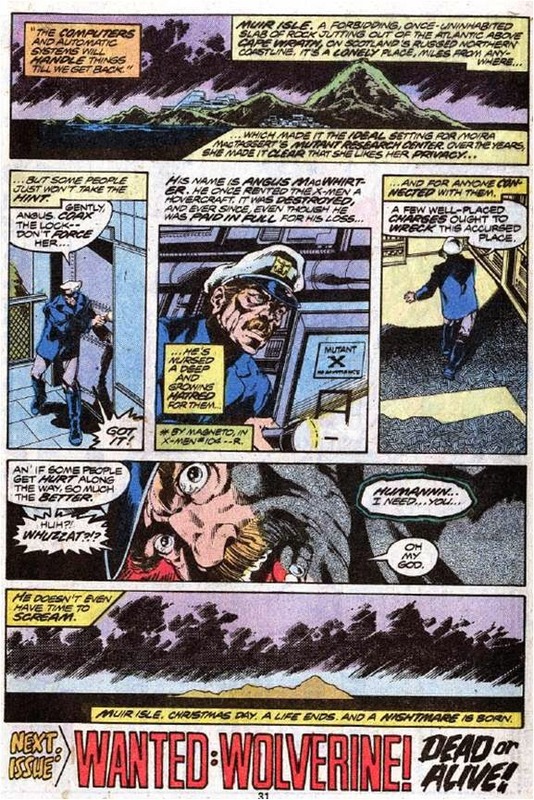 John Byrne is typical John Byrne from this era -- pretty darned awesome. Ric Villamonte's inks certainly weren't doing any damage, but you could just feel that the pictures were a little less slick without Terry Austin's TLC. But overall this was the beginning of what we know will be a 42-page "story", with just enough mystery and sub-plotting to keep us on that Claremont/Byrne/Austin rollercoaster, begging for more!